The comedian star of India, Kapil Sharma got married to his longtime girlfriend Ginni Chatrath on 12th December in Jalandhar. After that, the first reception party was thrown in Amritsar on 14th December, and now on 24th December, finally Kapil Sharma throw a grand wedding reception at JW Marriot hotel, Mumbai. Now some pictures from the wedding reception are coming out on social media. 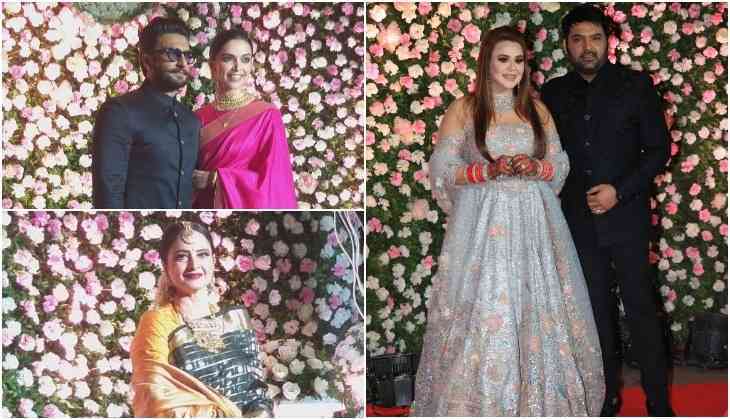 In these pictures, you will see Kapil Sharma and his wife Ginni Chatrath in the beautiful outfits, while Ranveer Singh and Deepika Padukone stole the limelight. Badhaai ho... Wishing Kapil Sharma and Ginni a lifetime of happiness. All the actors who came to Kapil Sharma's show attended the grand wedding reception of the comedian. Even the legendary actors like Dharmendra, Jeetendra, and Rekha also came to give blessings to the couple. Anil Kapoor who was celebrating his 62nd birthday on the same day also made his presence at the party, while any big superstar like Salman, Aamir, and Shah Rukh didn't come to the party. However, to fill the space of Salman Khan, his younger brother Sohail Khan came with his father Salim Khan to attend the party. Karan Johar also saw coming with actor Kartik Aaryan.